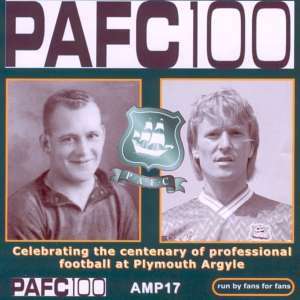 A hundred years of professional football at Plymouth Argyle has produced legends and folklore, heroes and classics, and games and goals that will live forever in the memory. Now, for the first time, those games and those goals are captured exclusively in one bumper video. Some of the Argyle fans' favourites guide you through the seasons. From Alex Govan in the fifties, via Mike Bickle, Paul Mariner, Tommy Tynan and up to the present with Paul Wotton, this unique video features a dozen Argyle personalities who have been in the spotlight in the Theatre of Greens. There is goal action and memories from all of the promotions of the last thirty years, while excusive action from the film vaults pits Argyle against the big guns in one FA Cup and two League Cup semi-final campaigns. But it is maybe other games that will stir the affections of Argyle fans: the day Mike Bickle beat Swindon a week after they won the League Cup; Hughie Reed's diving header against Torquay; and the night England paraded their World Cup at Home Park. Other unforgettable highlights include the visit of Pele and Santos; Jim Furnell's penalty save against crystal Palace; and - in the heartbreaking category - those agonising defeats at the hands of Burnley in 1990s. The crowd scenes at games like the Colchester play-off win and the big day at Wembley show the depth of Argyle support and this goal-packed video shows the breadth of the club's playing adventures over their first 100 years. If you were there for those games, you'll want to be reminded; if you were not there, then enjoy these moments for the very first time. This is Argyle's second major video production this year, and like the first - The Dream Season, 1975 - it's a wonderful record of the very best of times in the Pilgrims' history. This production is simply a must for all Argyle fans. If you haven't bought it already, you really must - it's a cracker! Gary Lovejoy was born and bred in Plymouth and came back to work for Westward TV from 1977-82. Since then he has lived in Hampshire and abroad, but, as with so many, his blood remains deep green. "What PAFC100 shows is how the fans have had to ride the green roller coaster, for many of us it�s a lifetime in two hours on VHS or DVD. So Argyle fans, buy the two offerings or there may not be more productions like them in the future. Argyle Media may have had a great time producing them but they have to make a profit so let�s see less ManYoo Goal rubbish in stockings around the world. Buy Green this Centenary Christmas!" Click here to read Gary's full account.